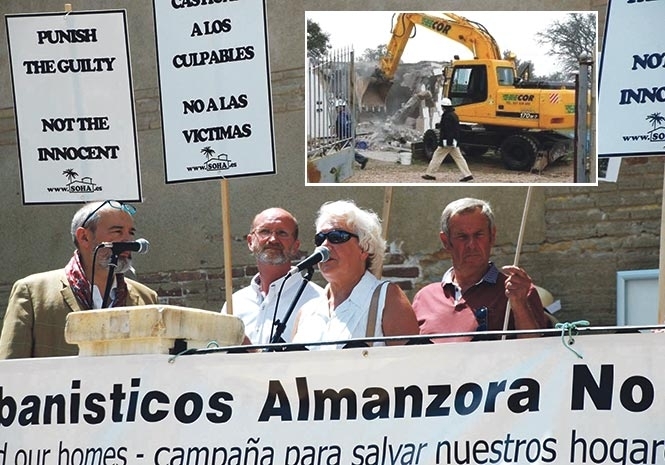 TEN YEAR BATTLE: Helen Prior speaks at a 2016 rally while husband Len (right) looks on and (inset) bulldozers demolish the couple’s villa in 2008. AFTER a decade of agony Helen and Len Prior have finally received a payout for their illegally demolished home. “Now this is over, we just want to try and recover our lives, we have lost 10 years that no amount of money can ever replace,” Helen said. It comes as the couple, both in their early 70’s, were paid a settlement of almost €236,000 by Vera Council. Helen thanked lawyers Victor Martinez and Jose Contreras for their “hard work over the last 10 years,” but pointed out that the payout is “very poor” since it does not even cover the original €350,000 cost of their home. “The house was legal and demolished for political reasons, we were scapegoats,” she said. “I was awarded €1,500 for ‘moral damages’ and my husband €7,500 for 10 years of suffering, ridiculous. “In any other EU country the amount would have been much higher,” she added. The Priors’ story made international headlines after their home was bulldozed over ‘planning irregularities,’ although the couple insist the build was legal after the town hall granted them a municipal construction licence in 2002. But their two-storey dream villa was pulled down in 2008 and they were forced to live in a garage for four-and-a-half years, with the demolition order later annulled by the Constitutional Court. In 2016 they won a court battle entitling them to €425,185 in compensation, but the Andalucian High Court of Justice later ruled that they should receive just over half that amount. They had initially requested €800,000 which included a €200,000 emotional damages claim, but the latter was reduced to less than €10,000. Gerardo Vazquez, lawyer and spokesperson for the Abusos Urbanisticos Almanzora No (AUAN) campaign group, which has been helping the Priors through their ordeal, said: “As a spokesperson for AUAN, I am very happy for the Priors. “I hope that you can at least continue with your lives more peacefully. “With the good humour that has characterised them during the last 10 years that their struggle has lasted, they have shown great tenacity and resistance and are an example to all of us. And Helen added that at least “our case has helped others. Politicians from the local Popular Party have called for a public apology to the Priors via social media. Why English and other northern European people still support the Spanish economy? This theft based sun trap is rediculous. People should not go there on a holiday and not buy any houses. Spain is full off retarded white collar thiefs that have no other way of making money than by stealing it from Northern Europeans. Simple as that. Spain was doomed to be a third world country and than the colder Western Europeans came with their hard cash.. Such a pitty these thiefs received so much wealth by just stealing and lying..
What is the full story about this terrible crime. What are the answers to the following questions? 1. Was the land that the house was built on designated rustic or not for residential builds? If so, why did the lawyers acting for the seller/developer not stop or even sanction the sale? Did they as in the past, expect the old ruse where the price of the home inclues a fine that was payable when the build was found to be illegal, but left intact when the fine was paid? Or did the developer and the Prior’s legal person expect that the old system would work in this case? 2. Are the two lawyers stil being allowed tompractice? And rthe concil representative who signed the build and services licences, how much jail time is he or she serving? 3 The taxes for residential dwellings are often, iam informed, based only on the land value so future demolishments (which should never happen now) the payouts will only be based on the land value as it appears to be in this case where the Priors have lost the cost of the home building. This needs changig to the total costs plus reasonable damages for the stress that the victims suffer. 4. I have read that when the house demolishing was done, the local Court declined to get involved and the Priors legal team had to go to Strasbourg, the EU, for justice, but when the total payout awarded by the EU Court was announced the guilty (‘) Vera Ayuntamiento applied to the local Court with an appeal and the local Court reduced drastically what was in fact the correct sentencing to be fair to the Priors. Is this true? 5. What job in local government if any, is the person who signed the licences now engaged in? Surely after a jail sentence, he/she was banned from holdingpublic office for so many yeaers as is the usual sentence in such cases? What amount was that official paid (if any) for the bribe? I have not yet seen a full and accurate report on this crime yet. Can anyone please advise me at: [email protected]?